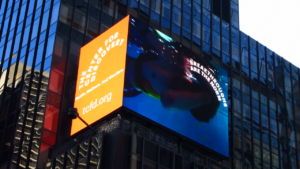 From December 1st until January 31st, The Center for Discovery will have its presence felt throughout the world when our video will be seen by millions – right in the heart of Times Square. Times Square, also known as the “Crossroads of the World”, is a major commercial intersection located at Broadway (curving westward) and Seventh Avenue in the Midtown Manhattan section (W 42nd to W 47th) of New York, and is huge tourist destination and entertainment center – full of lights, life, and color – especially during the holiday season. The Center for Discovery is committed to advancing scientific understanding and standards of care through its interdisciplinary research program, and has engaged in groundbreaking research for more than a decade. Based on its research insights, The Center has established a Research Institute focused on understanding the intersection of biology, behavior, and the environment – the crossroads of complexity. So it’s only fitting that The Center will make its mark, right at the “crossroads of the world”, for all to see. We look forward to sharing our bold, life-changing mission with all. Now through the end of January, visit us in Times Square. 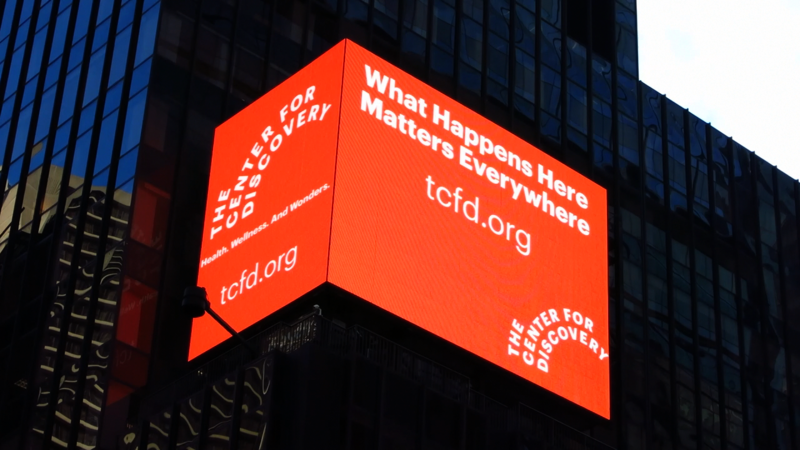 If you get a picture of our video shown on the big screen, send it our way at MediaStudio@tcfd.org. Just like our mission, we’d love to share it with the world.